Mobile application has started to occupy large shares of application industry. Gone are the days when applications were just used in computers or laptops. Now-a-days, the demand for the applications that run in mobile or mobile application has been increasing in leaps and bounds. It might have to do with the increase in the production of mobiles with new and latest technology. 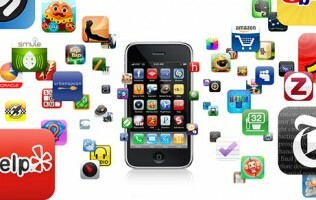 As the mobile industry soars to the sky, so does the mobile application industry. It’s like they are the different parts of the same coin. Along with the increase in the demand of mobile application, there has been great rise in the company related to mobile application development from India. When people want to get news about sports or technology, they no longer rely on the television. They no longer want to open their computers and search in the internet as well. They want an application that provides them with all sorts of news in their mobile itself. The reason behind this is that people carry mobiles with them at all the time and with the development of Wi-Fi and GPRS it has become even easier to use the internet in the mobile. This is the new trend. People want everything in their mobile. Be it news, weather report, information about fashion or even hairstyles techniques. That is why android mobile app development and iPhone mobile application development has started to skyrocket. It’s a well known fact that iPhone and Android are like oil and water. They have been each other’s competitors for a long time. Each of them wants to outdo others in terms of mobile market as well mobile application market. So, it came as no surprise when the apps that ran in Android mobile did not run in iPhone and vice versa. But, those days seem bleak as people wants mobile applications that work in both platforms. In very simple words, they want cross platform mobile application. This is a very tough job because the developer will have to create such an application that works in totally different operating system. But, with new technology and developer’s talent this feat can be easily accomplished. People hate applications that do not work or that cause a lot of problem for the mobile itself. Once that impression has settled in the consumers will not even look at that mobile application in the future. So, if you are planning to launch a new application then you should make sure that the application works pretty nicely and does not cause any unnecessary hassle to the user. After all, you would not want to get some negative reviews for worst android mobile app development. So, it is important to hire the right developer and company for such tasks.